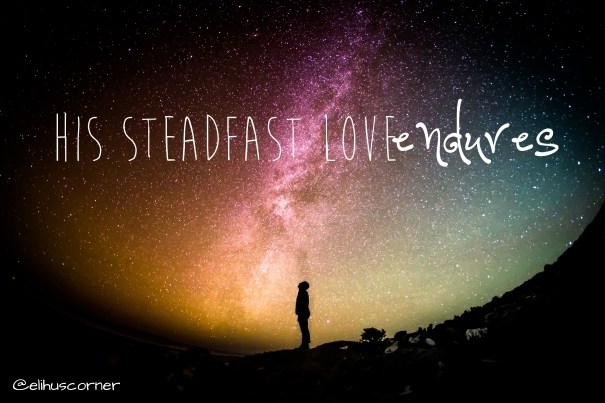 Day 3: I am thankful for God’s steadfast love. For the past two days, I have been listing reasons why I am thankful for a particular thing, but today I’d like to do something a little different. I am thankful for God’s unfailing love, but there are such a vast array of scriptures on this attribute of God. It would take me a long time to discuss all the aspects of God’s great love. Even then, I’d surely miss something. So for this post, we are going to focus on one particular passage: Psalm 107. What does it mean to be steadfast? It is defined as “resolutely or dutifully firm and unwavering.” Does that describe God’s love? Yes! His love is unwavering, unfailing, and dutifully firm. He is faithful even when we are faithless. He is merciful when we deserve only justice. Who knows how many millions of words we shall speak and write in our short lifetimes. What percentage of those words will be spent praising and speaking of our Lord? How often do we give thanks for His great love? It should be in my daily prayers, but often forget to thank Him for his love. I thank Him for his grace, my salvation, and the blessings of this life, but I need to remember to give thanks specifically for His unfailing, steadfast love. Has the Lord redeemed you through the sacrifice of His Son, Jesus Christ? Give thanks! Have people come to serve the Lord from all over the world? Give thanks! The Lord shows His love in the Wilderness. Have you ever been in a “wilderness period” in your life? It could be a time when you are in a holding pattern or a time when there was no one to worship with. It’s a lonely time, but one in which we become more dependent on the Lord. We understand more fully the breadth and width and height of his great love. Give thanks for those times! When you sought the Lord and longed for Him, did He leave you hanging? No. He satisfies us with his unfailing love (Psalm 90:14). The Lord showed His love while we were still sinners. So many pictures come to mind in the above verses, but I will focus on this: We were prisoners of sin and darkness. Through Christ, the bonds of sin were broken. Thank God for His Son and freedom from sin! And like a flood, his mercy rains. Give thanks! We are set free. We have been given mercy instead of justice! The Lord shows love through healing. This section brings to mind the Israelites in the wilderness. They complained to God about their plight in the wilderness and he sent fiery snakes. Many died and were near death. They asked Moses to pray to God to remove the fiery serpents, and the Lord did. How often does our greed or our complaint bring greater trouble? More often than we care to admit! And yet, God is patient with us because, like a good Father, he loves his children and remembers that we are but dust. I also like this section: “offer sacrifices of thanksgiving and tell of his deeds in songs of joy!” How much time do we spend speaking and singing of all the wonderful things God has done for us in this life compared to how often we complain about all the things going wrong? I am going to try something and I hope you will join me. (If you are around me regularly, please remind me of this if I start to grumble about some inconvenience). When you get ready to complain about something, find something to be thankful for instead. Instead of grumbling complaints, let’s shout our blessings. The Lord shows His love in the storms of life. One day he got into a boat with his disciples, and he said to them, “Let us go across to the other side of the lake.” So they set out, and as they sailed he [Jesus] fell asleep. Is Jesus in the boat with you? Is He dwelling in your life? When the storms of life are raging about you, does He bring tranquility to your heart? Give thanks for the peace that passes understanding! I am so thankful for these accounts and these Psalms because life so much like an ocean—unpredictable and ever-changing. Sometimes there is calm and peace; other times the waves threaten to crush us. Only God has power over our lives. I can have peace knowing He is in control. I am thankful that He loves me so much and brings such reassurance. The shows us love by providing for us. Be wise with me and consider the steadfast love of the Lord. Where would we be if God did not love us? What would life be like without God? So many people think that bad things happen because God doesn’t care. They are looking at things backwards. The terrible things of this life happen for a reason. The first reason—there is evil all around us in the world. Countries full of poverty are usually destitute because of the greed of other men. Women are raped because of the lust of men. Men are killed because of the violence of humanity. What about “natural disasters?” Let me ask you this: is this world meant to be our eternal home? Natural disasters remind us of God’s great power and our powerlessness. When has a scientist ever stopped a storm? The destruction, the brokenness, the heartache remind us that this is temporary. They draw us closer to a far better country with a ruler who is always fair and just. A King, a father who loves us with an unfailing love. Give thanks to the Lord. His steadfast love endures forever. Next Post Day 4: I am thankful for small pleasures.